BB Stamps Ltd and incorporating Mark Sargent Stamps. Welcome to our GB stamps website. We hope that you find the site very useful for your collecting requirements and that you enjoy having a browse around the site. The original production of this site started in 1998 and we believe was then and still is the most advanced GB stamp site in the world. To say that it has taken literally thousands of hours over the years to bring you this site is an understatement. Several people have now contributed to bring you this latest version and it has been mostly enjoyable except when things don't go the way they were planned and then it's a nightmare. If it doesn't contain the things you are looking for, then please contact us via the contact link on almost every page, as we have far more in GB that is not listed. The site was originally started by Mark Sargent in October 1999 and for many years was the largest part of his Business, ( Mark Sargent Stamps ). As technology in computers advanced, several versions of the site were built to keep pace. You are now on version number five. This new site is still being developed and enlarged in order to give you a superb variety and selection of GB stamps. Whilst Mark still has an interest in the site, he was a full time stamp dealer for 26 years and has now decided to take semi retirement and spends most of his time in Spain. Mark’s semi retirement lead to myself, Brian Bayford taking over the business, hence the site name changing from Mark Sargent Stamps to BB Stamps Ltd. I have been going slightly longer than Mark and started full time in stamps in 1988, I took a different route to Mark in that I liked to post out hard copy price lists as I could never understand the internet and websites. Over the years this has changed and I now understand the appeal of being able to sit at home and buy stamps 24 hours a day. 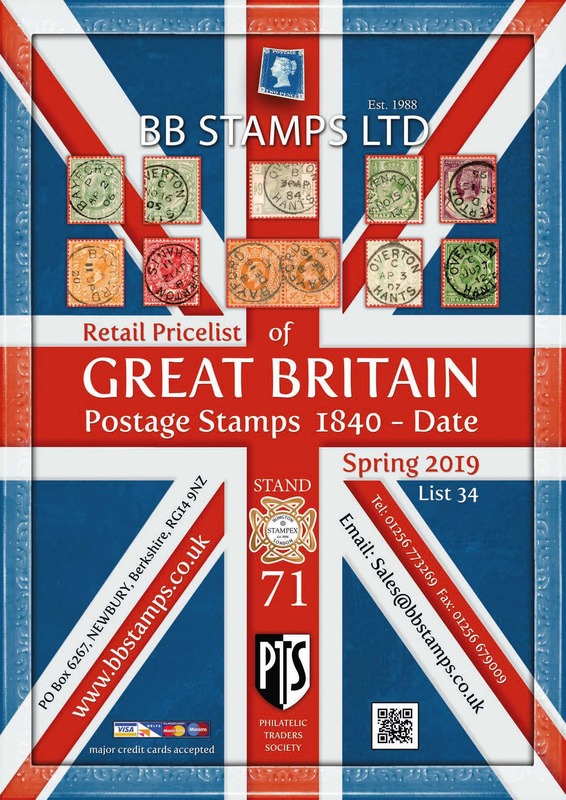 I do still attend shows all around the country and a list of them can be found HERE, if ever you are coming along do let us know as we carry very little stock to the shows, except Stampex -- we take too much to that !. After many months of hard work, we are pleased to be able to bring you this latest version of Mark's original site, there is a lot still to do with scans etc but we feel it is ready to go live. The size of the stock on this site is huge and we probably have more items listed for sale than all of the major supermarkets. We are always here and so feel free to contact us at any time, it is still nice to actually talk to customers. BB Stamps Limited is Registered in England and Wales. Company number 4584200. Registered Office is at Cassidy's Chartered Accountants, South Stour Offices, South Stour Nursery, Roman Road, Mersham, Ashford, Kent, TN25 7HS. Telephone number : 01256 773269. Email : sales@bbstamps.co.uk. Brian & Mark ( even though he is in sunny Spain ).